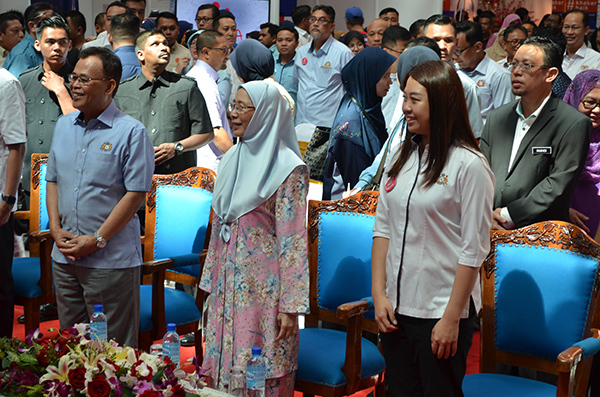 Deputy Prime Minister Dato’ Seri Dr Wan Azizah Dr Wan Ismail had recently officiated the Santuni Rakyat Programme of Johor state level that took place at Angsana Mall Johor Bahru, marking it as her first official appearance in Johor. The Santuni Rakyat Programme is an initiative under the Ministry of Women, Family and Community Development (KPWKM) that promote the services offered by the Ministry and all its agencies. During the programme, booths from various agencies had lined the exhibition area to provide the public with the required information. Among the booths on site were Yayasan Pembangunan Keluarga Darul Ta’zim (YPKDT), Malaysia Digital Economy Corporation (MDEC), Kumpulan Wang Simpanan Pekerja (KWSP), Unifi, SME Bank and Menara Optometry besides other NGOs such as IKRAM, MAP and JEWEL. Upon her arrival, the Deputy Prime Minister was welcomed by thousands of visitors wishing to meet such an inspirational woman in person. Staying true to the objective of the programme, Dr Wan Azizah was seen interacting with the public in a meet and greet manner as she made her way to the officiating site. The ceremony started off with a welcoming speech from the Menteri Besar of Johor Dato’ Osman Bin Haji Sapian. In his speech, Osman expressed his and the state government’s support for programmes like this and explained the plans of the state government in helping the public through the Johor Budget 2019 such as to upgrade the state’s Home Shelter for Kids and Old Folks Activity Centres in hope to provide better shelter for those in need. He also addressed his support for the programme Mama Friendly, a project run by none other than Exco Liow Cai Tung, Johor’s State Chairman of Women and Tourism Development Committee, who was also present at the officiating ceremony. The DPM addressed her gratitude to the Johor State Government for realising her wish through this Santuni Rakyat Programme. She humbly spoke upon the significance of such an event in reaching out to the people as the focus of the audience was on vulnerable populations like older women, mothers and children. She also briefly touched upon other government initiatives to help these populations through the Budget 2019 such as Insentif I-Suri, Talian Kasih 15999 and Community Based Approach programmes under the Ministry. After the officiating ceremony she then visited the booths personally with other VIPs before taking her leave.